U.S. Rep. Keith Ellison fielded a number of questions related to hot-button issues during his appearance on Monday, March 12, as part of the BOOST TASC Speaker Series. 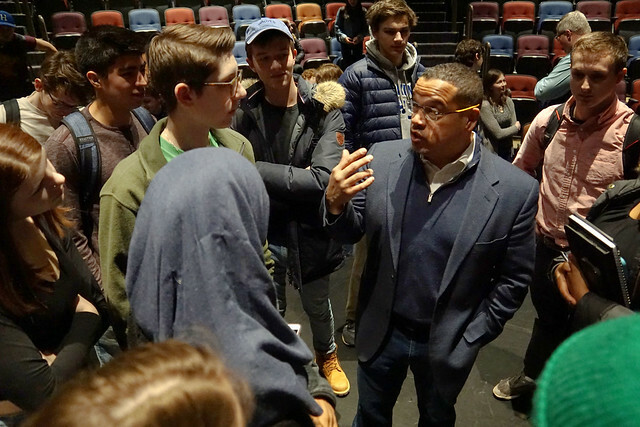 Hopkins High School students had a candid conversation with U.S. Rep. Keith Ellison on Monday, March 12, during the recent edition of the BOOST TASC Speaker Series, where they asked hard-line questions about issues facing teens today. For over an hour, Rep. Ellison talked with and fielded questions from students on a range of topics from reducing gun violence, safety in the schools, and mental health to the environment and health care. Students talked openly about how these issues affect their learning and shape their views, with many saying they are considering running for an office in the future. BOOST TASC Speaker Series coordinator and Hopkins High School social studies teacher Rick Rexroth said he reaches out to public officials of all parties in an effort to introduce students to a variety of viewpoints. He said engaging with lawmakers also teaches them how to make their voices heard at the local, state, and national level. Rep. Ellison is one of several Minnesota politicians to be featured as part of the BOOST TASC Speaker Series. To date, the series has attracted U.S. Rep. Paul Erikson, Minnesota Secretary of State Steve Simon, former Minnesota Sen. Terri Bonoff, and several local justices. The speaker series is made possible through generous support from the Hopkins Education Foundation.